Edith Peterson Mitchell, MD, FACP, FCPP, is Board Certified in Internal Medicine and Medical Oncology and is Clinical Professor, Department of Medicine and Medical Oncology at Sidney Kimmel Medical College at Thomas Jefferson University and Associate Director for Diversity Programs and Director of the Center to Eliminate Cancer Disparities for the Sidney Kimmel Cancer Center at Thomas Jefferson University. Dr. Mitchell received a bachelor of science in Biochemistry “with distinction” from Tennessee State University and her medical degree from the Medical College of Virginia in Richmond. In 1973, while attending medical school, Dr. Mitchell entered the Air Force and received a commission through the Health Professions Scholarship Program. She entered active duty after completion of her internship and residency in Internal Medicine at Meharry Medical College and a fellowship in Medical Oncology at Georgetown University. Dr. Mitchell has authored and co-authored more than 100 articles and book chapters as well as many abstracts on cancer treatment, prevention, and cancer control. As a distinguished researcher, she has received many Cancer Research and Principal Investigator Awards including a recent Promise Grant from the Susan G. Komen Foundation. She serves on the National Cancer Institute Review Panel and the Cancer Investigations Review Committee, the Clinical Trials and Translational Research Advisory Committee, serves as Co-Chair of the NCI Disparities Committee, and is a member of the NIH Council of Councils. Because of her experience in the cancer research community Dr. Mitchell was selected to serve as a member of the NCI’s Blue Ribbon Panel convened to advise the National Cancer Advisory Board on Vice President Biden’s National Cancer Moonshot Initiative. 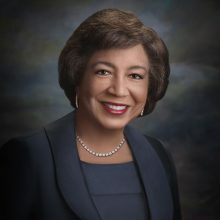 Dr. Mitchell holds leadership positions in the American Society of Clinical Oncology and served as the 116th President of the National Medical Association serving from August 2015 to August 2016. She also serves on the editorial board of the Journal of the National Medical Association and on the Board of Trustees for Geisinger Commonwealth Medical College and Tennessee State University. Among her many honors, Dr. Mitchell has received The ‘Tree of Life’ Award which recognizes health professionals who have made extraordinary contributions to health management in both the local and global community. Dr. Mitchell was awarded the American Cancer Society’s Cancer Control Award for her significant commitment to research, education, and diversity and Research Award by the Council of Women Physicians of The National Medical Association. In 2010 she received the National Cancer Care Physician of the Year Award in recognition of her outstanding contribution of time and talent. Other awards for Dr. Mitchell include the 2009 Looking Glass Award presented by the Living With Cancer Foundation and the Women in Medicine Research Award from the National Medical Association. She received the 2011 Practitioner of the Year Award by the Philadelphia County Medical Society and the 2012 Humanitarian Practitioner of the Year Award by the American Society of Clinical Oncology. In 2013 she received the Lifetime Achievement Award from Alpha Kappa Alpha Sorority, Inc., was inducted into the National Historical Black College Hall of Fame and also received the Octavius Valentine Catto Award for community service in the City of Philadelphia from the Mann Center. In 2015 she received the Medical Tree of Life Award from Debbie’s Dream Foundation: Curing Stomach Cancer. In 2016 Dr. Mitchell was selected as the Historically Black College Alumnus of the Year. Recently, Dr. Mitchell was inducted as an Honorary Member of the American Society for Radiation Oncology during their 2017 Annual Meeting. In addition to her medical achievements, Dr. Mitchell is a retired United States Air Force Brigadier General, having served as the Air National Guard Assistant to the Command Surgeon for US Transportation command and headquarters Air Mobility Command (AMC) based at the Scott Air Force Base in Illinois. General Mitchell has been awarded over 15 military service medals and ribbons including the Legion of Merit, Meritorious Service Medal, Air Force Achievement and Commendation Medals, National Defense Service Medal, and Humanitarian Service Medal. Dr. Mitchell was selected for inclusion in America’s Top Oncologists. Dr. Mitchell is a Fellow of the American College of Physicians; member of our Society; also the American Medical Association, the National Medical Association, Aerospace Medical Association, Association of Military Surgeons, the Medical Society of Eastern Pennsylvania, the Eastern Cooperative Oncology Group, Radiation Therapy Oncology Group, and the National Surgical Adjuvant Breast and Bowel Project. On a personal note, Dr. Mitchell enjoys gardening, quilting, listening to jazz and rock music, and spending time with her family. She and husband Delmar, have been married for forty-six years and have two daughters, Dale and DeAnna, one granddaughter, Gabriella, and two grandsons, Jude and Luke.